Liberty Mutual is a US-based, Fortune 500 insurance organization employing over 45,000 employees with 900 offices across the globe. Marketing and educating users on the tools and resources the intranet offers and how to best utilize it. When developing a methodology to this project, Prescient drew from its experience working on comparable projects for other insurance and financial service organizations like ACE Group, Intact Financial, HSBC, PNC Financial Services and USAA. Prescient met the challenges of improving Liberty Mutual’s intranet through a two phase approach, first consisting of an Assessment Phase, which identified Liberty Mutual’s business requirements and allowed Prescient to build a unique data set. Business Requirements Interviews: Multiple intranet stakeholders were interviewed to determine the strengths, weaknesses, opportunities and threats of the intranet as perceived by key Liberty Mutual personnel. Focus Groups: Three focus groups in offices across the United States allowed Prescient to gather qualitative data regarding the usability of the site and how employees felt The Source compared to examples of other corporate intranets. 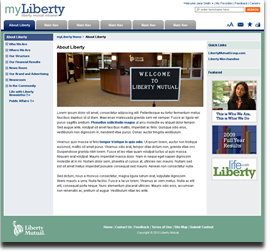 User Survey: A cross-section of Liberty Mutual intranet users were invited to participate in a survey, which enabled Prescient to cast a wider when determining data points such as user satisfaction rates, areas of improvement, and relevance to job. Site evaluation: The Source was evaluated using Prescient’s unique methodology (Design and Layout, IA and Usability, Content, Tools, Planning, Search) and a set of recommendations for improvement were given. Benchmarking: Prescient benchmarked Liberty Mutual’s intranet against two competitors’ intranets to show the organization how theirs compared to others in the industry. 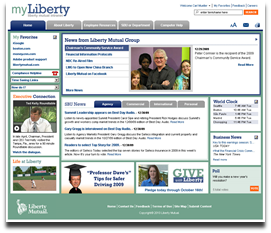 This baseline of comparison gave Liberty Mutual the opportunity to see real world examples of best practices put into action and provided them with context for developing their own intranet. During the Assessment Phase of the project, Liberty Mutual found that it had an additional opportunity to make improvements to The Source and engaged Prescient to stay on for the remainder of the project. Strategic Planning: Prescient developed a strategic plan that outlined Liberty Mutual’s missions, goals and objectives to ensure the longevity of the renewed site, while considering the challenges of the organization’s unique space in the competitive insurance industry. Governance Model: Prescient facilitated a workshop to help develop an appropriate governance model that identified the roles, tasks, and commitment levels of each intranet team member to ensure the site’s ongoing maintenance. Content Management Plan: Prescient developed a content management plan to help identify suitable publishing and workflow processes as well as considerations for the creation, migration and removal of content on the current intranet. Information Architecture: Using the information gathered in a card sort exercise, Prescient created a new information architecture and accompanying set of wireframes which corrected The Source’s siloed approach to site navigation. Functional plan: Prescient created a functional plan which specified the necessary components (e.g. search, navigation and feedback tools) of the new site at different stages of the intranet rollout, ultimately aiding in the new site’s usability. Prescient met the challenge of providing Liberty Mutual employees with support in their roles, and creating a single point of information and communications. The combined efforts of the Prescient and Liberty Mutual teams led to the creation a “one stop shop” for information, which enabled productivity and collaboration while simultaneously encouraging and endorsing the Liberty Mutual culture.